Once it’s agreed that the founder will earn a salary, we’ve uncovered that the amount is significantly correlated with the valuation of the company. You might have fun using our results to predict your own salary! (Or for investors, founders salaries). The results: For every £100,000 increase in valuation, founder salary tends to increase by roughly £1300 per year.Founder Shares & VestingAnother key point in term sheet negotiations is the question of how much equity the founder still owns after the investment, and the conditions those shares are subject to. It’s in the investors’ interest after all to ensure that founders stay within the company, and not walk away with a sizeable chunk of the equity rendering the company essentially un-investable for future rounds. On the other side of the table however, founders have worked hard to build their company from the ground up. The question of ownership is a hotly debated issue. A common way to satisfy both parties is the use of founder share vesting, where both founders and investors agree that part or all of the founder(s) shares be withheld for a certain amount of time after the investment. The ‘vesting period’ is the length of time it’s agreed that the founder(s) needs to stay in the company in order for their shares to be fully returned to them. So, how common is founder share vesting in early stage rounds? For pre-series A deals, our data shows that two thirds of deals include founder share vesting in the term sheet, with the majority of those agreeing to a 3 year vesting period. Interestingly, we also found out that the inclusion of founder share vesting was not correlated with whether or not the founder will earn a salary post-investment. During the vesting period, shares are returned to founders bit by bit, usually on a monthly or quarterly basis. However sometimes a delay is built into the vesting schedule, called a ‘Cliff’, where the first tranche is only released after an agreed period of time. This is designed to ensure founders are committed to staying in the company for at least the initial Cliff period, since they would otherwise leave the company without any shares vested. Our data shows a third of funding rounds include a cliff period in vesting schedules, and of those the vast majority opt to do the first share release at the 12 month mark. The date at which the shares start to vest is also agreed in the term sheet. Vesting usually commences on the date the investment closes. However our data shows that 40% of the time, founders and investors agree that the fairest start date is prior to the funding round, selecting either the date the founder joined the company, or the date that the company was incorporated. Counter-intuitively, we also noticed that the earlier the date from which shares start to vest, the longer the ‘vesting period’. So, if you ask for your investor for your vesting to start earlier, expect them to push for a 3 to 4 year vesting period. 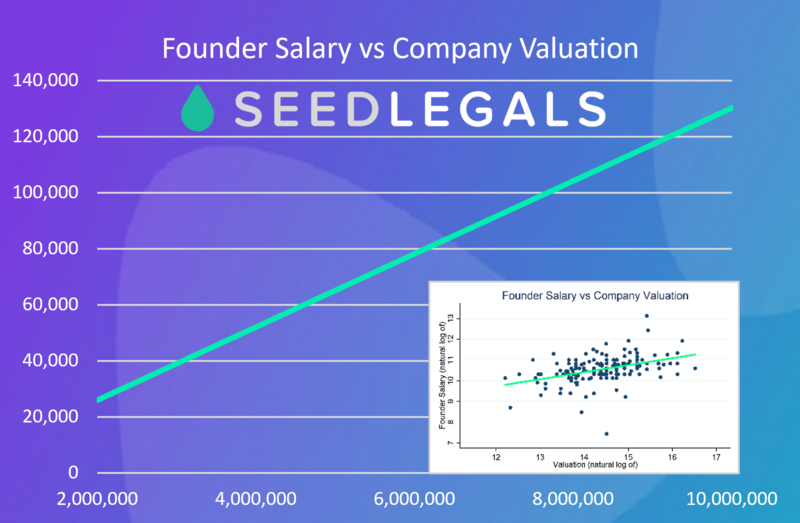 Stay tuned for our next data snapshot, where we’ll be looking at UK venture stage deals, and how these differ from the early stage rounds we’ve covered here.If you have any questions, or would like more data from SeedLegals in helping to calculate founder compensation for your own round, hit the chat button and our team will be more than happy to help.